You know those yellow fruits, the one's that sometimes grow brown spots and look like bruised, well, banana's! We all have them from time to time, there's no need to feel ashamed, to hide them from your friends and family, or to worry... Just bake them up into something delicious! If you're like me, you hate to see banana's start to turn brown, they reach a point where you really don't want to keep them on your counter because your guests will inevitably think that you are a wasteful person who doesn't eat your fruit. Or... Maybe that's just me... I've mentioned that I'm extremely OCD right? I can't stand waste, I hate having clutter, and overly ripened fruit sitting on my counter just makes me feel guilty for not eating it in the first place! So this week when I saw those fatefully over ripe beauties I decided that this time (because I will admit there are times when they don't get used and end up moldy and tossed) I was going to bake. And not just bake, but create! It started as a poll on Facebook for Muffins or Bread (overwhelmingly the response was muffins) and then my wheels started spinning. I remembered a beautiful bundt pan my wonderful Sister In Law gave me months ago that was still sitting all pretty and unused in the box. And I sat down, with a pen (which is rare for me) and a recipe card, and wrote out a recipe. From scratch, and my brain (two slightly scary places however food seems to taste good that way) and out came this delightful treat! Next time you need an easy and delicious dessert, or want an impressive breakfast or brunch cake I hope you'll give this a whirl! I can't wait to try it next time with cinnamon chips! YUM! In a large mixer, cream together butter and sugar. Then add in the eggs and mix until fully incorporated. While that mixes, mash your banana's with the lemon juice (this helps keep the banana's fresh). Pour into the egg mixture along with the vanilla and sour cream. Mix on medium speed until fully combined. In a large bowl whisk together the flour, baking powder and soda, salt, cinnamon, and nutmeg. Then with the mixer on low, add in the flour mixture 1/2 cup at a time until fully incorporated and thick. Then using a spatula fold in the chocolate chips. Coat your bundt pan with cooking spray and flour, then using your spatula gently spread the batter into the pan evenly, then bang the pan a few times against the counter to get out the bubbles. Pre-heat your oven to 350F degrees, and bake for 50 minutes until golden and toothpick inserted comes out clean. Allow to cool in the pan, then invert onto a serving dish and sprinkle with powdered sugar. This was so incredibly easy, and fun to make. My little sous chef was helping me with everything, and loved tasting this at each different stage. I can't wait to make this again with cinnamon chips next time, or even add a chocolate glaze to the top of this one... Yum! 5 stars. First let me say, I need a bundt pan like yours. What size is that one? The cake is so tall and pretty! Great recipe. I love any kind of banana bread/cake recipes!! Just the name of this post caught my attention. The best thing about bundt cakes is that they are packed with flavor (no icing required) and yours does look like a winner. Have a great day. Those slices look so darn good. If only I had a piece right now. ;) Cinnamon chips in the next version sound great. Oh this looks delicious. We're in the process of moving and I just found 6 banana's in the bottom of my freezer.. I may have to whip this up as one last baked good! Your Banana Chip cake is gorgeous. A bundt cake makes the cake look more special for some reason than a pan cake. I have bananas in my freezer, so I know what I'll be making next. If you have brown bananas, that you don't have time to use, just toss them in the freezer. Then, when you have time, take them out of the freezer, and you're ready to bake. I am tagging you for the 7 Links, please visit my blog, and check it out. I would love to see a line up of your amazing recipes! 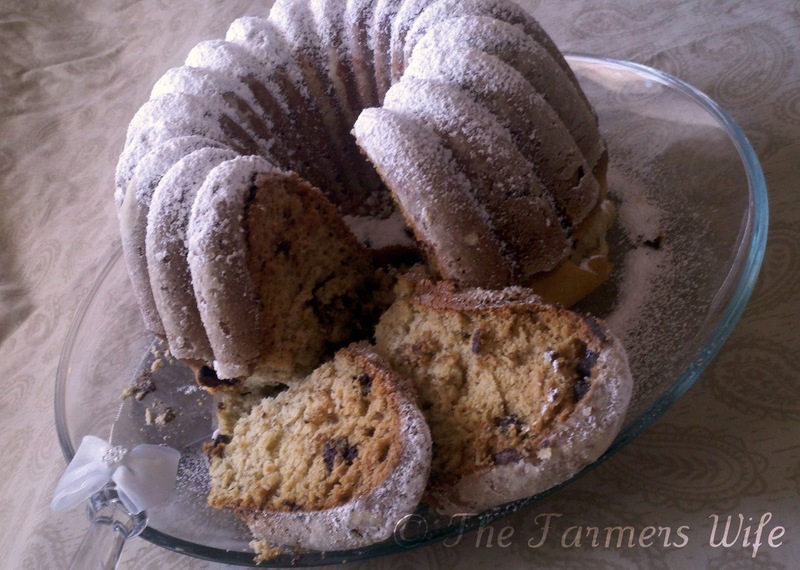 Kim not only that this recipe sound so tasty, but your cake look really beautiful! And banana-chip..mmm yummy and perfect for anytime of the day!Love your recipes! That is absolutely lovely! Sounds like breakfast to me! Beautiful cake, I love baking bundts! I can't wait to give this a try as I need a fresh look on my "old" banana cake recipe. Thanks for linking up with your favorite Pioneer Woman recipe this weekend. It's fun to see how many of us enjoy so many of her recipes. What did you think of her show? Thanks y'all!!! We loved this cake SO much, I can't believe how quickly we ate this baby... haha! @Katie @ Pinke Post, I loved Ree's show. I think I expected her to be slightly more animated like she was on Throwdown, but overall she did a fantastic job and I loved seeing more of their Ranch! Great looking cake! Love banana chip, will have to try it! Thanks for the visit, glad you stopped by, now I can see what a terrific blog you have! Good lord girl this cake looks heavenly I just want to devour it! 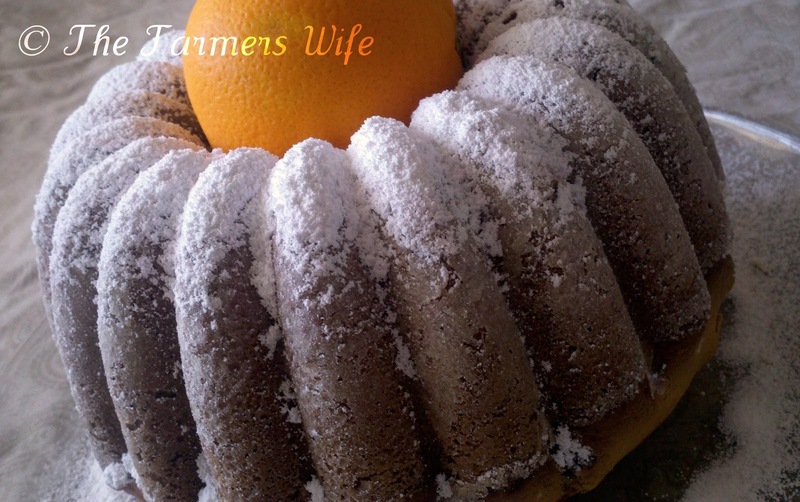 Oh, I LOVE your Bundt pan!!! And such a beautiful cake...you can eat this for breakfast, right??? ?